Stunning early 19th century view of New York City. Newyorks Hamn och Redd Fran Brooklyn pa Longisland. The harbor is full of small sailing vessels, yachts, and schooners which come from all America's ports to this mid-point of all movement. Usually these ships are well-painted and are built in a light and handsome style. The steamboats which come and go like stagecoaches add great activity to this picture. Behind the city itself the great Hudson River empties into the harbor, which is large and reaches as far as New Jersey. This grand panorama is bounded by the New Jersey coast and the highlands on the other side of the Hudson. Modern New Yorkers may have a hard time recognizing this 19th century variant their fair city, but the steeples of Trinity Church and St. Paul's Chapel are clearly visible as are many of the docks and harbor buildings of what can only be South Street Seaport. This view was engraved from Klinkowström's sketch by Carl Fredrik Akrell and published in C. Muller's Bref om de Förenta Staterna. Axel Leonhard Klinckowström (1775 - 1837, alt: Klinkowstrom) was a Swedish Baron active in the late 18th and early 19th century. Pressured by his ambitious father, Klinkowström joined the Swedish navy as an ensign at 17 and rose, in the course of a long career, to the rank of Lieutenant-Colonel. Nonetheless, Klinkowström was not naturally militaristic and tended towards a more philosophical and artistic temperament. It was most likely Klinkowström's skills as an artist that lead his superiors to send him to America. Between 1818 and 1820 Klinkowström traveled to the United States to investigate the American invention of the steamboat and assess its military potential for the Swedish navy. During his American tour Klinkowström composted some 25 illustrated letters which were published in 1824, roughly four years after his return to Sweden, as Bref om de Förenta Staterna. The compilation not only offered practical advice for the military, merchants, and gentleman travelers, but contained numerous aquatints based on Klinkowström's drawings and offered a Tocqueville -esque commentary on American culture. Carl Fredrik Akrell (January 13, 1779 - December 11, 1868) was a Swedish military cartographer and engraver active in the early 20th century. Akrell was born in Uppsala, Sweden to a middle class family. He joined the military as a young man and exhibiting proficiency with mathematics was assigned to the survey department where he worked under Gustave Wilhelm af Tibell. He participated in the fortification of the Stockhom archipelago and fought with distinction in the battles of Gross-Beeren, Dannewits, and Leipzig. Following a distinguished showing in the battle of Leipzig, Akrell was honored as a "Knight of the Sword" and adopted into the nobility. In time Akrell attained the rank of Major General. Cartographically Akrell is best known for his engraved maps of Stockholm and the aquatints he etched for Jean Baptiste Le Chevalier's Trip Propontiden and Black Se and Axel Leonhard Klinckowström Bref om de Förenta Staterna. Muller, C., Atlas til Friherre Klinckowstroms Bref om de Forente Staterne, (Stockholm) 1824. Rumsey 5757.015. Stokes, I. N. Phelps, The iconography of Manhattan Island, 1498-1909, 3:563 (1820-E-99). 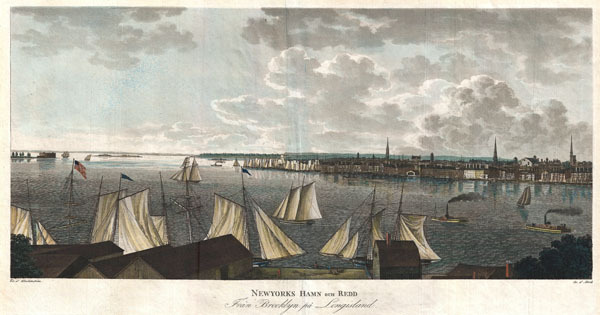 Deal, G., Picturing New York, 322. New York Public Library, Stephen A. Schwarzman Building, Print Collection, Miriam and Ira D. Wallach Division of Art, Prints and Photographs, 118407. Sabin, J., Biblioteca Americana. A Dictionary of Books Relating to America, from its Discovery to the Present Time, (29 vols), 38053. Howes K201. Newberry Library Case G 833.459.